A somewhat slow movie about an interesting man who lead an unusual life. J. Edgar is a Clint Eastwood film, and that tells you a lot right there. These days, Clint Eastwood is the guy making the long, often slow-moving, artistic Oscar movies. he’s the guy who made the nelson Mandela movie, Invictus, and the world war II, U.S. vs. Japan movies, flags of our fathers and then Letters To Iwo Jima. His movies are definitely interesting, but they also try your patience. And they are always serious dramas. Many of which even involve real historical situations. Eastwood’s movie, J. Edgar, doesn’t veer all that far from his usual film. It’s as long and as muted in color as most of his other movies, but it also have some things that the other films don’t. For one, there’s Leonardo Dicaprio. We’ve seen Dicaprio play historical figures in long and slow moving films before (Scorcese’s the aviator), but in recent years, Dicaprio has become one of the better actors in Hollywood. In 2010, he starred in what I considered to be two out of the three best movies of the year, with both Shutter Island and inception. 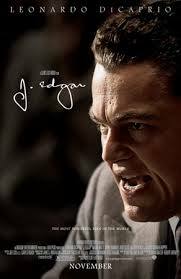 With J. Edgar, Dicaprio gets to play not only a historical figure, like he did in the aviator, but one who truly had an impact on the future world. J. Edgar Hoover is the guy who started the FBI. He’s the guy who started the idea of fingerprinting criminals and taking fingerprints from crime scenes. He believed in studying the crimes and not disregarding evidence. And the movie covers all of that. It shows how this guy rose up to Power with his revolutionary ideas and attitude about putting work ahead of everything else. The movie definitely digs deep into the man and his character, so that we understand his issues with relationships and dating, and how is mother (Judy Dench) was such a big influence over his life. What it doesn’t have is enough plots. I would have loved to see Hoover take on john Dillinger, pretty boy Floyd, and baby face nelson. Those were the criminals who really were taken down by Hoover’s unit during the time when he was running the show, and yet we only hear about what happened. And we hear about it briefly too. We hear the name Melvin Purvis thrown around as the guy who killed Dillinger, but never even get to meet Purvis. At the very least, we should have gotten a scene where Purvis came in to meet with Hoover and tell him the events of what happened with the killing of Dillinger. Similarly we get involved with the Kennedys, having bobby Kennedy meet with Hoover on a couple of occasions to discuss some tapes of his brother, the president, john, having relations with a woman who was not his wife. But the scene ends up being little more than a conversation. Maybe we could have gotten a scene of bobby going back and reporting the news to john, and of the two of them talking about Hoover. The one situation that we do get to explore is the Lindbergh baby kidnapping. It’s a big headline crime, we watch as Hoover, and his boys go out to Charles Lindbergh’s house and start investigating. We also see an attempt at making a deal with the kidnapper and get to see the results of the whole thing when it finally gets wrapped up. The Lindbergh baby storyline is great. We should have gotten one or two other criminal story lines in here just like it. The reason why we don’t get a couple of different stories, like we should have, is because this movie is so much more about character than plot. I suppose Eastwood might have felt like movie audiences just saw the story of john Dillinger on the big screen recently with the movie public enemies, and so that story didn’t need to be told again. But then we should have gotten something else instead. There were any number of criminals that ran in that gang with Dillinger, all with high profile names, and this movie could have chosen any of them. But instead, it chooses none. The movie does devote a lot of time to Hoover’s relationship with his best friend / number two men. This character is Clyde Tolson, played by The Social Network’s Armie Hammer. It’s a very intriguing storyline, with the two men not wanting to admit their feelings for each other until one day Hoover finally mentions the idea of marrying a woman. That’s when all hell breaks loose and we see these feelings that the two men have kept bottles up for all these years, finally bust out. Armie Hammer is really great in his role here, and he actually pulls off the old man look and mannerisms better than Dicaprio does. The makeup is good, but it’s not good enough. 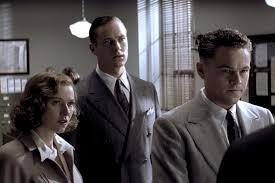 J. Edgar is definitely an interesting movie, but it could have also been a lot better. A movie that had the character tackle different criminals throughout history would have been pretty amazing. But this isn’t an action film. It’s more of a character study and it definitely pulls off what it sets out to accomplish. The big problem, then, is the length of the movie. If only it could have been condensed a little more, it would have felt much faster moving. Dicaprio is great as usual and so is Armie Hammer, but the pace of the film and lack of excitement at times makes it feel slower than it should. Never boring, but certainly too long.